Fluorescent lamps (fluorescent tubes) and compact fluorescent light bulbs (CFLs) are slowly replacing the traditional incandescent lamp. Fluorescent lamps and CFLs convert electrical power into useful light more efficiently by using mercury as vapor inside the glass tubing. Most CFLs contain 3–5 mg of mercury per bulb, with the eco-friendly bulbs containing as little as 1 mg. Even in small amounts mercury is still poisonous and creates a potential risk for landfills and waste incinerators where it can contribute to air and water pollution. Thus, the EPA classifies fluorescent lamps and CFLs as hazardous waste, and recommends that they be segregated from common waste for safe disposal and recycling. Thermometers: Mercury-in-glass thermometers are being phased out, but older ones still exist and need to be handled with care. 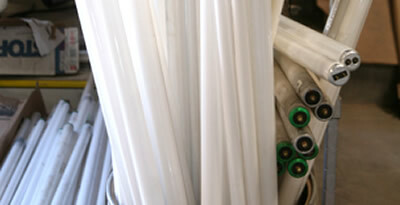 Where Can I Recycle Fluorescent Lights & Mercury? BuRRT CFLs can be dropped off 7 days/week at BuRRT between 8:00 a.m. – 4:45 p.m.
Where Can I Recycle Fluorescent Lights & Mercury From Commercial Collection? NEMA maintains this list of companies in the United States and Canada that claim to recycle spent mercury-containing lamps or handle lamps so as to ensure they end up at a recycling facility. In the U.S., recycling companies must meet the definition of a “Destination Facility” and operate under a state permit or RCRA-equivalent authority to perform lamp recycling (per RCRA 40 CFR §273.6). Handlers are either generators or third party brokers that collect lamps and get them to recyclers. INCLUSION ON THESE LISTS DOES NOT CONSTITUTE AN ENDORSEMENT OR RECOMMENDATION BY NEMA OF THE COMPANIES OR THEIR TECHNOLOGIES. NEMA RESERVES THE RIGHT IN ITS SOLE DISCRETION TO EXCLUDE COMPANIES FROM THIS LISTING. PERSONS CONTACTING THE LISTED COMPANIES SHOULD MAKE THEIR OWN INVESTIGATIONS AND DETERMINATIONS ABOUT THE COSTS AND APPROPRIATENESS OF THE ACTIVITIES OF THE LISTED COMPANIES. The Association of Lighting and Mercury Recyclers (ALMR) is a national organization that represents lamp recyclers, Universal Waste Handlers, mercury and rare earth element reclamation companies, and related equipment manufacturers. ALMR member companies network with each other so that lamps can be collected and recycled from anywhere in the country. Additional information about lamp recycling can be found at www.almr.org . The International Association of Lighting Maintenance Companies (NALMCO, www.nalmco.org) represents lighting maintenance companies in the US, which may provide spent lamp management recycling services as part of their lighting maintenance operations. Ideally, place your old tubes in the same box in which they were purchased. If that is long gone, place your used CFLs in a sturdy container (i.e. box or bucket) with a lid. Label your container and keep it in a safe spot, away from children and pets. If you can’t find a large enough box, try to bring them to a collection center soon after changing them out. When transporting the container, put it in your trunk, back seat, or wrap them so they won’t roll around or tip over. • Air out the room for 5-10 minutes by opening a window or door to the outdoors. • Shut off the central forced air heating/air-conditioning system, if you have one. • Be thorough in collecting broken glass and visible powder with the cardboard and sticky tape. DO NOT use a vacuum cleaner! • If practical, continue to air out the room where the bulb was broken and leave the heating/air conditioning system shut off for several hours. If CFLs contain mercury, which can be bad for the environment and my health if not properly recycled, then why should I switch from the traditional incandescent light bulb to a more efficient CFL? In areas with coal-fired power plants, the use of CFLs saves on mercury emissions when compared to the use of incandescent bulbs. This is due to the reduced electrical power demand, reducing in turn the amount of mercury released by coal as it is burned. Coal-fired power plants also emit other heavy metals, sulphur, and carbon dioxide which can be very hazardous to your health. 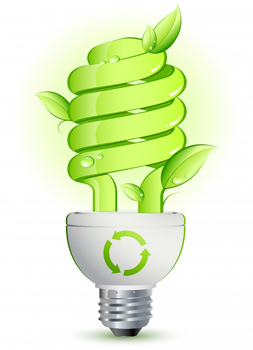 Overall, a CFL uses less energy (roughly 90%) than an incandescent bulb which reduces the emissions at the source. Read more information on CFLs & Mercury on the EPA’s website.